If you were having a heart attack and dialed 911 on your mobile phone, which would you prefer: Responders arriving in your neighborhood are stuck trying to determine which household needs help, or responders are pounding on your door because they know your exact address? Such questions need to be asked in light of the FCC taking a look a how to handle wireless 911. Specifically, the FCC is contemplating a 50-meter accuracy goal, an approach that does not pinpoint an address. An alternate solution that provides far better accuracy — and more importantly, a real address instead of approximate coordinates — uses Bluetooth and Wi-Fi beacons. While a landline phone is linked to a physical address, wireless 911 today is based on X/Y coordinates calculated by various methods. The technology used most frequently by the wireless industry, Assisted Global Positioning System (AGPS), works well outdoors but can experience difficulty in some indoor locations where satellite signals cannot penetrate well. Public-safety organizations as well as consumers, many of whom have cut the wireline cord, are pressuring the FCC for improvements in location accuracy in case a caller can’t provide an address. High-density beacon technology, while seeing rapid adoption in consumer applications, has not previously been considered for determining precise location in emergency situations simply because it had not yet matured. However, it could be the basis for a far more accurate way to direct responders than anything possible in the past. Nervous cord cutters could finally feel safer, but only if regulators, consumers, and industry stakeholders give beacon technology the serious consideration it deserves. The use of Bluetooth-based beacons in consumer applications is growing quickly. 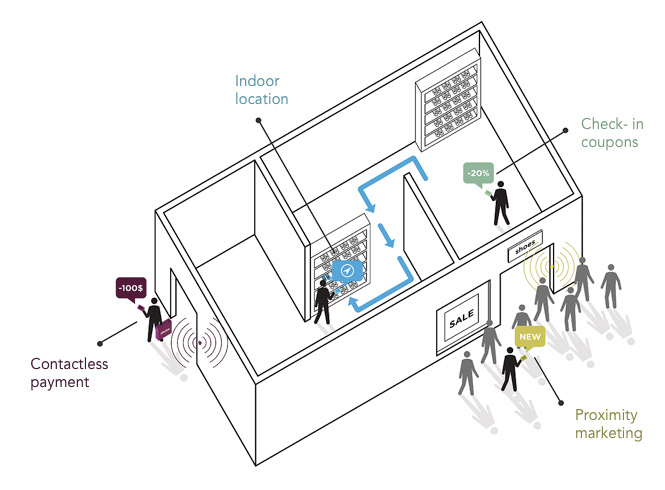 Apple employs the technology in its iBeacon indoor proximity system, for example. To work, beacons, each costing as little as $5, must be deployed throughout an area at fixed locations. Phones receive signals from beacons and, based on signal strength, can approximate the distance from a given beacon and report that location to the network or an end application. The maximum range is 50 meters. Consequently, where deployed, iBeacon can accurately track customer locations. Stores are the typical adopters of this technology, but beacons are also finding their way into museums, where they can provide users additional information based on their step-by-step location, down to the specific exhibit, as National Geographic did recently in its Washington, D.C., museum. Deploying beacons would present vast opportunities for users to interact more richly with their environments and for venues to learn about people and their movements. Apple has a long, successful history of introducing new technology when market conditions are receptive, so iBeacon is one sign that beacon technology has arrived. Now is the time to evaluate the role beacons could play for wireless 911. The benefits are overwhelming, and no alternative can deliver a dispatchable address. These alternatives include macro-level lower-density beacon technologies, RF pattern matching, AGPS/Advanced Forward Link Trilateration (AFLT), and Uplink Time Difference of Arrival (U-TDOA). The FCC’s notice of proposed rulemaking issued last February contemplates mandating an accuracy requirement of 50 meters in the horizontal plane and 3 meters in the vertical plane, to be implemented two to three years from now. This accuracy goal, if it could be realized, might be an improvement over existing accuracy requirements, but no technology exists today that can achieve it. Multiple candidate technologies, including ones from NextNav, Polaris Wireless, and Qualcomm, were evaluated last year by the Communications Security, Reliability and Interoperability Council (CSRIC), the agency tasked by the FCC to analyze potential approaches. As reported in the CSRIC “Indoor Location Test Bed Report,” none of the three location technologies met the 50-meter goal for any of the four location types, comprising dense urban, urban, suburban, and rural settings. Moreover, the FCC’s proposed accuracy goal fails to meet the most fundamental objective of public safety: enabling emergency responders to quickly reach the caller’s exact location. First, the 50-meter radius translates to a diameter the length of a football field, hardly pinpointing an apartment or home — 10 buildings could fall into that radius. Second, even if the coordinates were accurate, the translation of these coordinates into street addresses (via reverse geocoding) tends to render moot the accuracy of the initial position fix. Improving the accuracy of reverse geocoding will be a complex, long-term endeavor that will be akin to starting over. In contrast, beacons are configured to know the address and can quickly provide it to a phone, even if the user has Bluetooth turned off. When a user makes a call to 911, the dispatcher can still send help to the correct location because the beacon provides the phone the location, which is then supplied to the Public Safety Answering Point (PSAP). Two main challenges must be overcome for beacons to become a reality. The first is awareness. Consumers and our industry must get smarter on the capabilities of beacon technologies, their low-cost, and their ease of implementation. The second is making beacons ubiquitous, since none are yet available for wireless 911. However, no other technical approach has been deployed to any extent either. No reason exists to believe that a beacon approach will take any longer to deploy than other options. In fact, the widespread integration of Bluetooth and Wi-Fi in handsets means a beacon system could even be faster to deploy. Given today’s reality of having to implement any new solution from the ground up, why not do it the right way, using a dispatchable-address approach? Citi Field has beacons deployed. Multiple organizations, including local governments, agencies setting building codes, hotel associations, commercial real-estate enterprises, and others will need to become involved to encourage the spread of beacons. Widespread participation is both critical and appropriate—public safety is everyone’s responsibility. Fortunately the opportunities to deploy beacons are endless: They can be placed as low-cost standalone devices, within routers or set-top boxes, in overhead lighting, in emergency-exit signs, and so forth. The beacon is simply a low-cost, low-power chip. New-building codes could require their installation. Before they become prevalent in indoor locations, users could buy them with their new phones or could be encouraged to buy one from any electronics supplier. Some simple configuration would be required for entering the address, which could be done from a smartphone. A huge advantage of the beacon approach is that they are independent of any particular mobile network. The high-precision location information available from the beacon can be supplied by the phone to any mobile operator’s network. It can be supplied if the user is on a Wi-Fi connection. It can even work with any phone in the beacon’s range, meaning if you’re having a heart attack, your visiting friend can call 911 and their phone could work with your beacon. A GLONASS satellite, courtesy of NASA. Independently of what happens with beacon technology, two nearer-term developments will improve wireless 911 accuracy. First, devices will soon be able to receive signals from Russian GLONASS satellites, shortening satellite fix time and improving indoor location accuracy. Second, a system called Observed Time Difference of Arrival (OTDOA) will also improve location accuracy. OTDOA, already part of the LTE roadmap and about to become available at the same time as Voice over LTE (VoLTE), is handset based and uses measurements of signals from multiple surrounding base stations. Long term, a beacon-based approach that harnesses Bluetooth and Wi-Fi for accurate, address-based location seems to be the best possible approach. But creative thinking will be required to make beacons a reality since they require an infrastructure separate from the cellular network. With so much at stake, including our lives, we owe it to ourselves to do everything possible to make this superior wireless 911 approach a reality. Peter Rysavy, president of Rysavy Research, has specialized in wireless technology for over twenty years. Great article! Rysavy’s call to action is spot on. The life saving implications are enormous. The FCC estimates 10,000 lives saved per year, about 3x more than distracted driving death rates. We need to do everything possible to make superior wireless e911 location a reality. The solution that provides far greater accuracy uses Wi-Fi beacons, for WiFI-Lateration, Sensor Fusion for Terminal Assisted positioning, and indoor wireless infrastructure broadcasting street addresses. Wi-Fi is already all around us, and BLE beacon deployments will be another great source for Assisted Global Positioning System (AGPS) enhancing Indoor GPS. Am I the only one who sees the irony of an article discussing the deployment of beacons and a picture of a lady stranded in the desert? The potential for beacons is high and I am sure they will become quite prevalent, but the potential for abuse is higher. Just a quick look through the permissions of even the most benign apps will show you the hunger for tracking location and the lack of controls and governance for the use of that data. Add in the absolutely obsessive…and intrusive nature of advertisers, combined with governmental agencies around the globe and this is not a good path we are on. I am all for beacons, but only when the use of that data is completely and clearly in my control and completely transparent in usage when I do share it. will find this is good space for you. officialnygiantsstore will be good way for you to share.